The Pali Canon is one the earliest existing scripture collections of the Buddhist tradition. These scriptures were recited orally from the time of the Buddha and were put into writing in Sri Lanka around 30 BC. Written in the Pali language, these texts form the scriptures of the Theravada school of Buddhism. 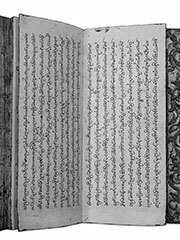 Versions of many Pali canon scriptures also form the basis of the canon of many non-Theravada schools. These schools canons typically contain an incomplete selection of scriptures from the Pali canon, often with minor additions or alterations, and are usually recorded in Sanskrit, Chinese, or another language other than Pali. The writings fall into three general categories, called pitaka (basket) in Pali. Because of this, the Buddhist canon is traditionally known as the tipitaka (Sanskrit: tripitaka) (three baskets). According to myth, this name resulted from the practice of keeping the scrolls on which the suttas were recorded in three baskets. However, calling the collection of Buddhist teachings the tipitaka may well predate the use of writing in preserving Buddhist scriptures- ‘basket’ may have been used figuratively to indicate a collection, or a carrier of an oral tradition. The three-fold pitaka division replaced a simpler, two-part division into Sutta (prose) and Vinaya (disciplinary rules). The first category, the Vinaya Pitaka, is mostly concerned with the code of ethics to be obeyed by the early sangha, both monks and nuns. Some rules and practices were regarded by the Buddha as essential and foundational to the pursuit of his teachings. Others were devised on an ad hoc basis as the Buddha encountered various behavioral problems or disputes among his followers. The second category is the Sutta Pitaka (literally «basket of threads», Sanskrit: Sutra Pitaka) which consists primarily of accounts of the Buddha’s life and teachings. The Sutta Pitaka has numerous subdivisions. The suttas it contains are considered authentic by every Buddhist school, although Mahayana and Vajrayana Buddhists also recognize many additional sutras. Practitioners outside the Theravada school refer to Pali Canon suttas as agamas or nikayas. The third category, the Abhidhamma Pitaka, is a collection of texts in which the underlying doctrinal principles presented in the Sutta Pitaka are reworked and reorganized into a systematic framework as applied to an investigation into the nature of mind and matter. The Abhidhamma per se is specific Theravada Buddhism; however, other schools have their own collections of commentaries that take the place of the Abhidhamma Pitaka in their respective tipitakas. The Pali Text Society, founded by British civil servant T.W. Rhys Davids, publishes both English translations and Romanized Pali versions of all the books of the Pali Canon. While some of the major sections of the Canon (such as the Digha Nikaya, Samyutta Nikaya, and Majjhima Nikaya) have been given more recent translations, the PTS versions remain the only English translations of some of the less accessible texts.